ZTE MC315 PCMCIA wireless network card equips with a standard Type II PC Card slot (available on most notebook PCs) and works as a wireless network card, a modem, and a mobile phone. This card allows you to connect to the Internet, send and receive short messages, and make phone calls, without a network cable or phone line. 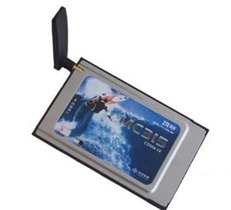 With the design of the R-UIM card separate from the body, MC315 PCMCIA wireless network card can make the operation more flexible.